Reliability of ignition switch recall repair? Wizard: my offically sanctioned [the switch to end all switches, AS Seen On TV] recall switch kept holding the key after the swap had been made. Still had to use the button under the steering wheel to release the key. There was a bulletin sent out to people who had done the recall and experienced problems after the repair. Mine was an open circuit in the Passlock system. GM made the repair, no charge. Ironic that this same POS switch won an obscure award for design in 2002. Don't know if you're having the same problem, but GM seems aware of people having problems post recall replacement. I hope that helps or sets you on the trail of a resolution. It's funny you ask because I was just thinking about the ignition lock cylinder recall today-I have had absolutely no ignition lock cylinder problems since it was campaigned. The ignition parts work fine as should be expected. It sounds like you got a lemon part and the dealer should help you out. 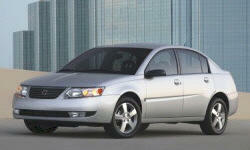 My previous car was a 1992 Saturn SL2 which I still own - so I am a Saturn glutton. That car also had some issues but had a way better suspension and interior compared to the Ion. Sorry GM - I have given up on you.